Wedding planning has indeed gone full throttle in 2018. Case in point: there’s a bridal fair almost every week, and it’s a simple matter for any soon-to-wed couple to just pop right in and shop for wedding vendors. Even with the prevalence of wedding fairs, it’s still very easy for engaged couples to be overwhelmed and stressed out. Putting together a dream wedding is surely no easy feat for anyone – most couples usually worry about having enough time to prepare, not having explored enough vendor options, or not being able to maximize their wedding budget. Happening in a few weeks is the Before I Do Wedding and Debut Fair. It is the longest-running intimate bridal fair of its kind, with over 70 vendors, each with special promotional offers exclusively for soon-to-weds. “It was last 8th of April 2018, when I’ve decided to visit the Before I Do Wedding and Debut Fair to check the resources in store for brides-to-be, like me. (I feel) I’ve made the right decision since I met a bunch of (suppliers who were) willing to extend their (assistance) just to make our wedding extra special and hassle-free. For first timers like me (to visit a bridal fair), I was amazed that on-site suppliers are approachable and not persistent to clients. They will give you ideas and tips on how to plan the details of your big day. “We needed a “one-stop shop” as we were running out of time, (but fortunately for us) everything was set after our visit at Before I Do. We had a satisfying experience. I believe it helped a lot of couples just like us, searching for the perfect pieces for their perfect moment. We were all over the place, literally! Everything that a couple (might) need was there and we had a hard time choosing, but that’s because all of the exhibitors were great. We even won a free prenup video without purchasing anything! We just registered onsite and our name was in! 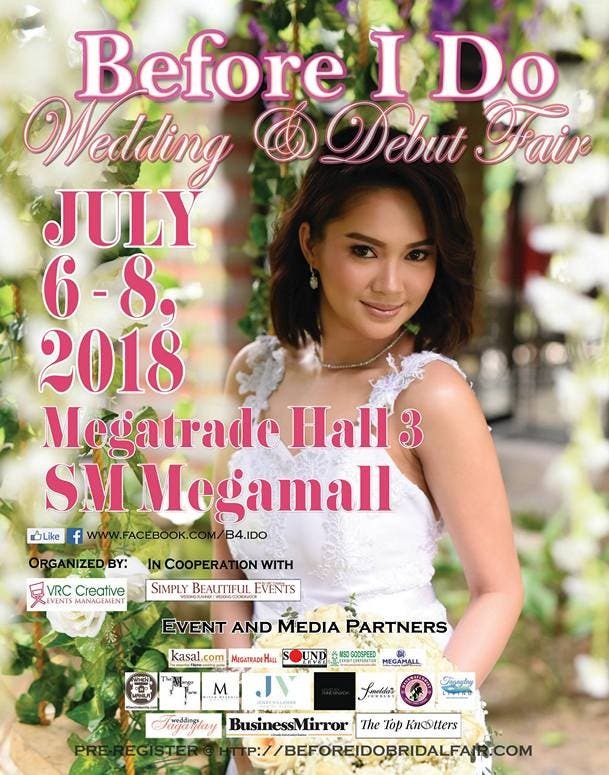 Brace yourself for an exciting bridal fair this July 6 to 8, 2018 at Megatrade Hall 3, SM Megamall for the 33rd Before I Do – Wedding and Debut Fair! Event vendors such as Diamond with Love Jewelry Shop, Elaine Celestino-Makeup Artist, J’s Diamond Jewellery, GQ Mobile Bar, Mick Perez, Les Alajeras, Cactus & Canvas, andProject Bliss Life Stories are all eager to be of assistance in helping you plan your big day. Also featured are fellow exhibitors Manila Diamond Studio, Gemline Jewelry, Studio 1 Photography, Coco Melody, Make Up by Miss A, Nelsy Ernst. Pro Make Up, Bounce Events Ground, Robert Camba Catering Services, Print & Co., Photoman, and AMI Jewels who are all giving great discounts and freebies for on-the-spot bookings. The 33rd Before I Do Wedding & Debut Fair is made possible with the help of our dear friends: Sound Level, SugarPetals Enterprise & Events Management, WhenInManila.com, Kasal.com, The Mango Farm, JenryVillamar Photo & Video, Makeup by Anne Magadia, Imelda’s Jewelry, Dangwa Florist, TagaytayLiving.com, Weddings Tagaytay, Business Mirror, The Top Knotters, MSD Godspeed, and Simply Beautiful Events. The Before I Do Bridal Fair series is produced and organized by VRC Creative Events 4 times a year at Megatrade Hall, SM Megamall where we have over 3,000 anticipated guests per event with not more than 100 of Manila’s established and upcoming event suppliers under one roof. Visit www.beforeidobridalfair.com to register online to enter for free. 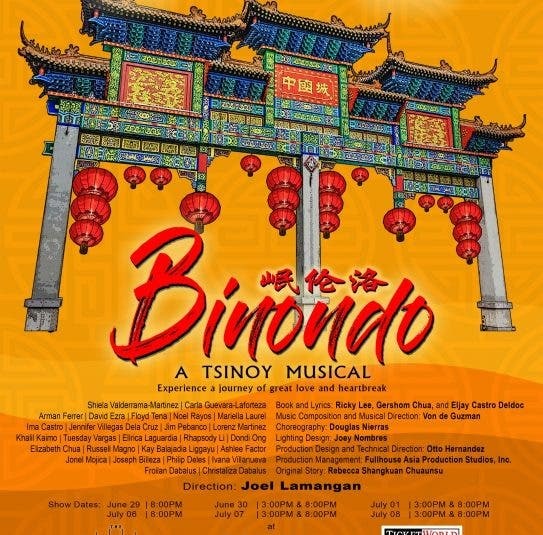 For inquiries on how to be an exhibitor, get in touch with our team at 8093119 or 09178587787.